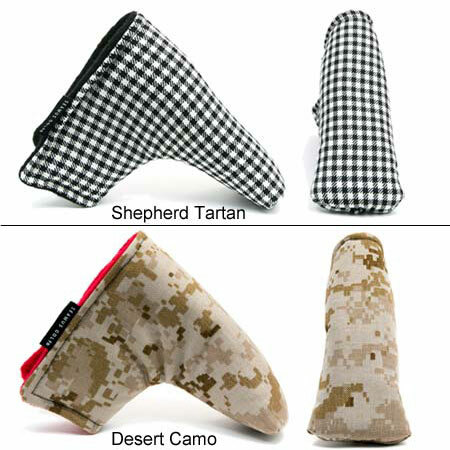 The Seamus Golf Blade Putter Cover has a minimalist design made with the finest of components to ensure your putter is protected. Fits all standard Blade 'Anser' style putters. 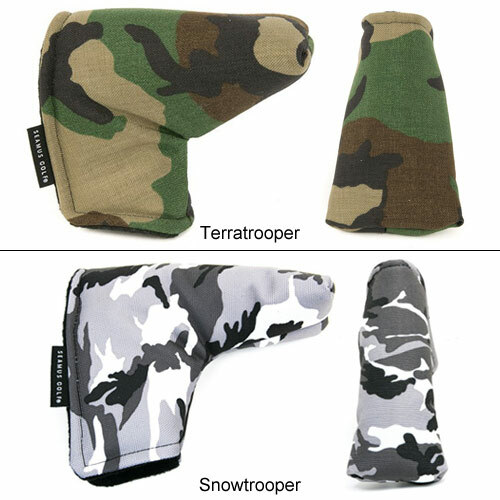 The Pacific Skies Blade Putter cover features Pendleton® wool from the Coyote Butte collection and orange fleece lining that compliments the unique pattern. To ensure a quality fastening we have included a black military grade velcro closure. 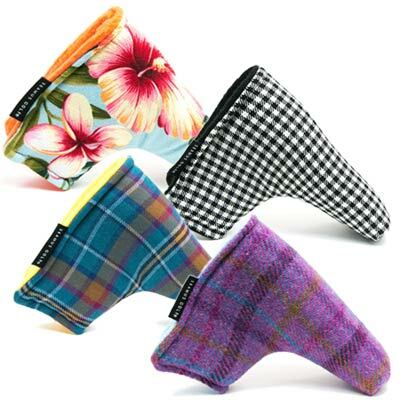 Each putter cover is made in our shop in Oregon by our team of fine artisan sewers. Featuring the Shepherd tartan from Scotland with black fleece lining and a military grade velcro closure. Each putter cover is made in our shop in Oregon by our team of fine artisan sewers. Guardian of the Sheep is predominately black and white. It is a cross weave of small light and dark checks. This style of tartan is one of the oldest in existence. Featuring the Doune tartan from Scotland with sky blue fleece lining and a military grade velcro closure. 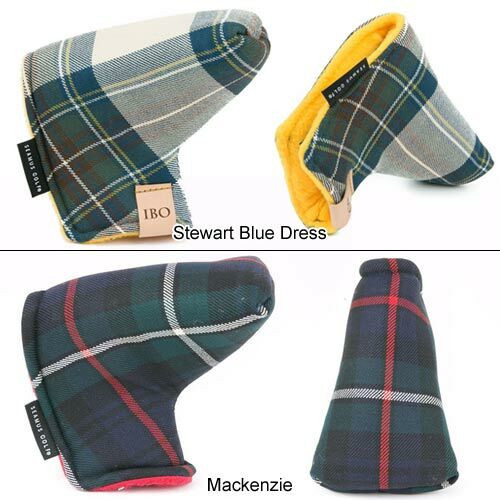 Each putter cover is made in our shop in Oregon by our team of fine artisan sewers. The Doune tartan is predominantly grey with light blue, black, and white in the over plaid. Featuring the Hiwahiwa Aqua cotton bark cloth with orange fleece lining and a military grade velcro closure. Each putter cover is made in our shop in Oregon by our team of fine artisan sewers. Made from densely woven cotton fibers, this bark cloth fabric is slightly textured, resembling the rough surface of tree bark. The timeless tropical design will add some Hawaiian flair to any bag. Featuring the tightly woven Cordura® 1000d fabric in desert camouflage with red fleece lining and a military grade velcro closure. Each putter cover is made in our shop in Oregon by our team of fine artisan sewers. Crafted from Desert Marshal Cordura® and matched impeccably to a red fleece lining. Ideal for golfers ready to go into combat at a moments notice. The Día de los Muertos Blade Putter covers features Pendleton® Sugar Skulls wool and lime fleece lining that compliments the unique pattern. The ensure a quality fastening we have included a black military grade velcro closure. Each putter cover is made in our shop in Oregon by our team of fine artisan sewers. Featuring the Red Stewart tartan from Scotland with a complementary gold fleece lining and a military grade velcro closure. Each putter cover is made in our shop in Oregon by our team of fine artisan sewers. Featuring the Douglas Grey Modern tartan from Scotland with black fleece lining and a military grade velcro closure. 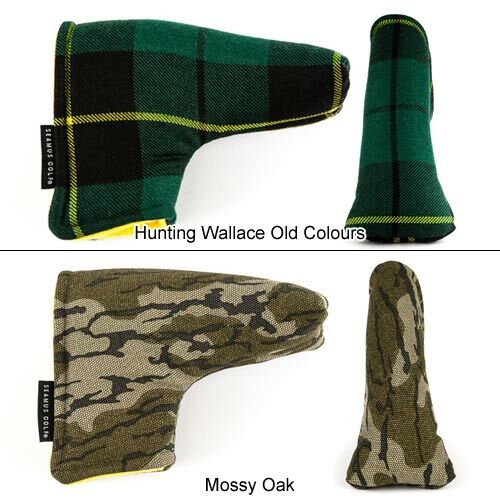 Each putter cover is made in our shop in Oregon by our team of fine artisan sewers. Featuring the Flora Harris Tweed from Scotland with sky blue fleece lining and a military grade velcro closure. Each putter cover is made in our shop in Oregon by our team of fine artisan sewers. The Harris Tweed Flora is from the outer hebrides of Scotland. It features a purple and pink tweed with burgundy, blue, and yellow subtle over plaids. 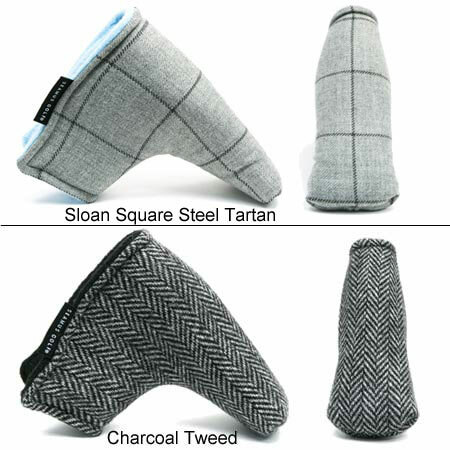 Featuring the Charcoal Tweed fabric from Scotland with black fleece lining and a military grade velcro closure. 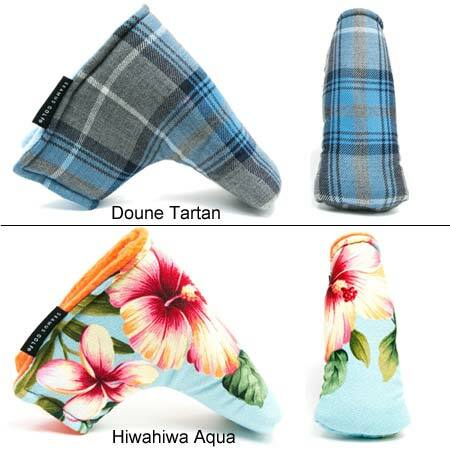 Each putter cover is made in our shop in Oregon by our team of fine artisan sewers. Featuring the Irish National tartan from Scotland with gold fleece lining and a military grade velcro closure. Each putter cover is made in our shop in Oregon by our team of fine artisan sewers. Fits all standard Blade 'Anser' style putters. The Irish National tartan is predominately green with black, yellow, and white in the over plaid. Featuring the Cian tartan from Scotland with gold fleece lining and a military grade velcro closure. Each putter cover is made in our shop in Oregon by our team of fine artisan sewers. The Cian tartan is a predominantly blue with gold, magenta, and blue in the over plaid. The name Cianachta means "of the Race of Cian." Pronounced "KEE-an." Featuring the tightly woven Cordura® 1000d fabric in winter camouflage with black fleece lining and a military grade velcro closure. Each putter cover is made in our shop in Oregon by our team of fine artisan sewers. Featuring the Sloan Square Steel tartan from Scotland with sky blue fleece lining and a military grade velcro closure. Each putter cover is made in our shop in Oregon by our team of fine artisan sewers. The Sloan Square Steel is predominately steel colored with a charcoal windowpane over plaid. Combined with a sky blue fleece lining, this style works great with a variety of other looks in the bag. Featuring the Grey Thistle tartan from Scotland with red fleece lining and a military grade velcro closure. Each putter cover is made in our shop in Oregon by our team of fine artisan sewers. Fits all standard Blade 'Anser' style putters. 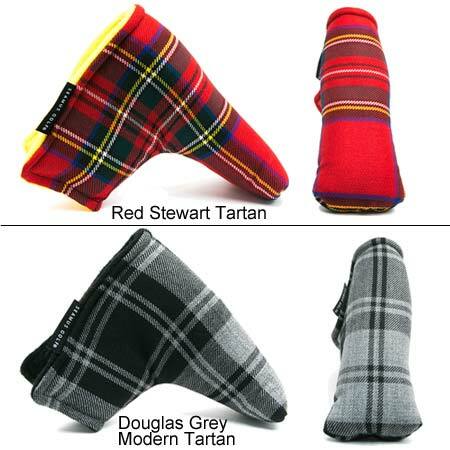 The Grey Thistle tartan is predominately black with a grey over plaid and red fleece lining. Featuring the Fitzpatrick tartan from Scotland with gold fleece lining and a military grade velcro closure. Each putter cover is made in our shop in Oregon by our team of fine artisan sewers. Fits all standard Blade/Mid-Mallet style putters. Featuring the Lilikoi cotton bark cloth with orange fleece lining and a military grade velcro closure. 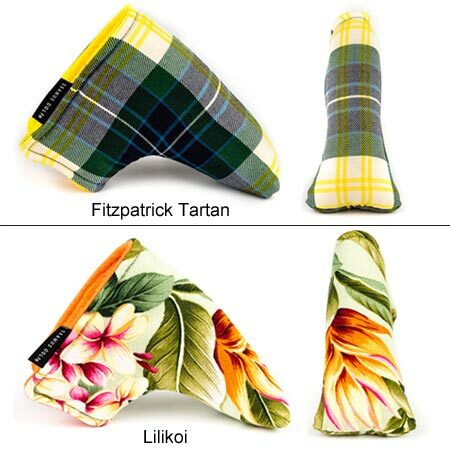 Each putter cover is made in our shop in Oregon by our team of fine artisan sewers. Fits all standard Blade/Mid-Mallet style putters.